The major variant between Winchester and the Caxton is that the Roman War episode in Winchester is twice as long as that in the Caxton. The system of textual divisions also differs: Caxton divided the text into books and chapters, whereas the Winchester scribes divided it by explicits and incipits, and by large initial letters. There are also many minor variants between the two texts, such as different spellings, different word order and word divisions, or variant uses of prefixes and conjunctions. Vinaver then ascribed two major differences between the two extant texts, textual divisions and the Roman War Episode, to Caxton’s editorial hand, and emphasised the opposite natures of the two producers: Caxton as the deliberate editor, whereas the Winchester scribes as a mechanical copiers (Introduction to The Works of Sir Thomas Malory, p. cix). Since then, Vinaver's view has been scrutinized by scholars from all sorts of perspectives. Lotte Hellinga's discovery suggested that the manuscript was kept in Caxton's workshop while Caxton was preparing for printing of the Morte Darthur. William Matthews argued that the 'Roman War' Episode in the Caxton was more authentic than that in Winchester. 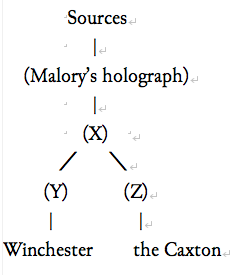 The existence of intermediate copies between Malory's holograph and the extant copies is now also open to question (See for example, Field, 'Earliest Texts'). However, Vinaver’s arguments in support of copy X, and hence the collateral relationship between Winchester and Caxton are still irrefutable.